There is more than one artist with the name Ikon; 1) IKON is an Australian goth/darkwave band that has gained an international following. Chris McCarter(vocals, guitar, programming) and Dino Molinaro (bass) began to create music as high school students in Melbourne, Australia in 1988. In 1991, their band Death in the Dark, which included Michael Carrodus on vocals, changed its name to Ikon. Ikon has released five studio albums, five EPs and seventeen singles, with additional unique versions that have been produced for Germany, America and Russia. The band's last full-length release, Destroying the World to Save it, attained number 21 on the Native DJ World Charts for best album of 2005. IKON has frequently toured Australia, Europe and the UK. Ikon has played on the same bill as The Sisters of Mercy, H.I.M., Soft Cell, Death in June, London After Midnight and The Mission. Ikon has performed at the Eurorock Festival (2001) in Belgium and at the M'era Luna Festival (2002) in Hildesheim, Germany before an audience of more than 15,000 people. 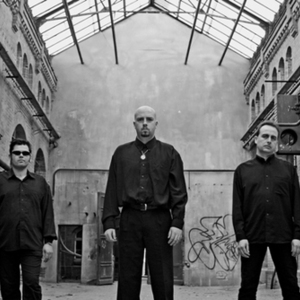 The band has also appeared three times at the world's largest goth festival, Wave Gotik Treffen in Leipzig, Germany, in 2003, 2005 (during that year Anthony Cornish joined the live line-up on guitar) and 2011. In 2007, the band embarked upon ?The Burden of History' tour of Europe to mark the release of the singles collection (1992-2007) of the same name. The EPs League of Nations (2007) and Amongst the Runes (2008) demonstrate a progression in IKON's signature sound, providing a taster of the forthcoming album Love, Hate and Sorrow (to be released in September 2009). While retaining the essence of influences such as Joy Division, early New Order and Death in June, the future for Ikon promises to add further texture to the band's style. Love, Hate and Sorrow embraces more melodic song structures without entirely relinquishing the shadowy threads that are interweaved in the lyrics, art work, and music of one of the world's most successful and enduring darkwave bands. The single "A Line on a Dark Day" from the album will also be made into the band's first video clip. 2) A UK collaborative project of Elliot Ireland and Alex Rizzo, the people behind the Jalapeno label. They utilise a wide range of guest vocalists and instrumentalists to create an interesting fusion of dnb, jazz, downtempo and triphop. They have released a self-titled album and at least 2 singles, 'The Dove' and 'Tricolour'. The album took a long time to make and was created in 7 different countries with 8 different collaborations, in languages such as Portuguese and English. "As for the Ikon sound it's tricky to categorise: bossa nova melodies seem to seep effortlessly into epic cinematic productions, which mutate into slick drum and bass rhythms." "Musically the group cites most genres as being influential to the Ikon sound, particularly jazz, funk, soul and hip hop." "What the hell is Ikon about? "Happy coincidences," opines co-founding member Alex Rizzo with a smile." "Ikon is about producing lush, imaginative music and recreating sounds in an original way. Give us a keyboard a string, synth or computer- Rolf Harris's stylophone and we'll play it- the quirkier the better. If there's a sound we wanna emulate we'll try and get the original materials: like a 60s bass and a 60s mic to get the right effect." 3) A religious community in Belfast with the CD "Dubh". 4) A since-disbanded Stratford-based metal band with the CD "Sterilized". 5) Ikon is a finnish thrash metal band from Kouvola, since spring 2007. 6) Ikon is a drum & bass producer duo James Smyth & Andy Walters from United Kingdom.